There seem to be different ways of building a community. It can develop entirely on its own, sprawling organically and uncontrollably, overspilling boundaries, sometimes going too far. Or it can grow organically around the nucleus of a charismatic leader (or perhaps leaders, maybe a husband and wife) who is so low-key that the idea of charisma seems inappropriate until you step far enough back to see clearly that yes, it is charisma, that the growth is neither rigid nor uncontrolled. And perhaps that central couple, those two who are the nucleus of the expanding, humming, vibrant bubble, are so modest — modest for real — that the thought of claiming any kind of credit for the vitality around them is borderline distasteful and makes them genuinely uncomfortable. That can’t be a very common situation — surely it is by far the least common of these three — but it’s what’s happened in Fair Lawn. Rebbetzin Shevi and Rabbi Benjamin Yudin of Shomrei Torah are at the center of the Orthodox community that they started to nurture when they first moved there, at the behest of Yeshiva University, exactly half a century ago. Next Sunday, the community will celebrate those 50 years with them at a gala (see box), as the Yudins move into an active, still-to-be-defined retirement, very much in place. Their story begins even more than 50 years ago. Shevi Werner and Benjamin Yudin both grew up in Crown Heights, in Brooklyn, back when Crown Heights was deeply Orthodox but not yet overwhelmingly Chabad. Shevi’s father, Irving Werner, was born in Brooklyn, from parents who came from Poland; her mother, Sarah Kesten Werner, was brought to the Lower East Side from Russia when she was 3 years old. Her father-in-law, Alexander Yudin, and her mother-in-law, Adele Bernstein Yudin, both were born in New York. The families were friends, and their children, who were the same age, grew up together; they were members of the same shul —Young Israel of Eastern Parkway — and went to the same school. “Our families walked home from synagogue together,” Rebbetzin Yudin said. “What started as close family ties and friendship, and similar background and beliefs, ended up in an engagement.” Both of them were 20 years old when they married. Both were in college — he in YU, where he got an undergraduate degree, a master’s degree in Jewish history, and smicha, rabbinic ordination, and she first in Brooklyn College and then in City. She also earned certification from YU’s Teachers Institute for Women. At first, the young couple lived in Washington Heights; she taught Hebrew school and he taught at YU’s high school, MTA. This was in the late 1960s, the cusp of the postwar and antiwar explosions. People were leaving cities; Jews, like their neighbors, were considering the appeal of grass and shrubs and single-family houses and garages and bicycles left outside overnight; they also were propelled by the increasing violence and poverty that they saw in inner cities. 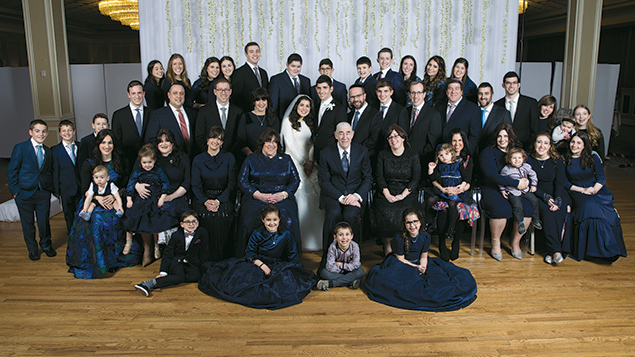 When the Yudins moved to Fair Lawn, the congregation, which was about two years old, had 17 families; 10 were active, Rebbetzin Yudin said, and the other seven were supportive, although they showed up far less regularly. Soon, it became clear that the community needed a rabbi all week long. Rabbi Yudin continued to teach, first still at MTA and then at YU — in fact, he still continues to teach at YU four days a week, as well as in Fair Lawn — but the job became full time, for both Yudins. To be clear, it is ludicrously inaccurate to call the work that Shevi and Benjamin Yudin do a job. It’s a life. It’s their lives. Their joint life. It is not melodramatic to say that their two hearts, together, have become the beating heart of the community. “My husband loves being able to combine being a pulpit rabbi and a teacher,” his wife said. “He never wastes any time. His Shabbos table is a teaching experience.” What about her? “When I saw the amount of work he was doing, I realized that it was better for me to join his life, and to complement whatever he does,” she said. “Basically, he leaves every day and I am the one who is here to answer the phone, to answer the doorbell, to give him messages.” And of course to counsel and to cook and to listen and to give warmth. “My day is never boring,” she said. 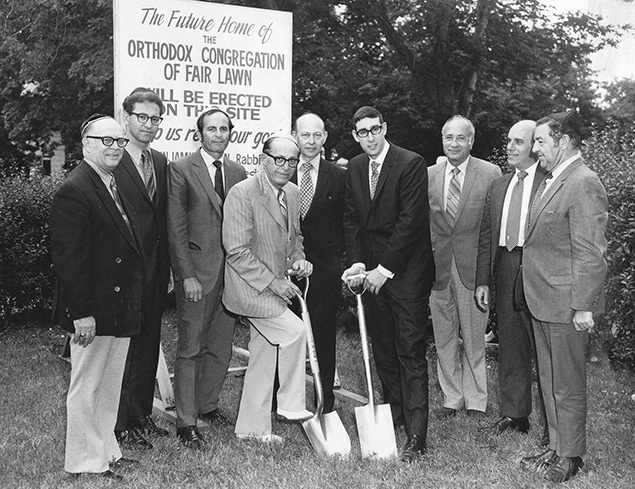 Men from some of the founding families break ground for the new synagogue building in 1979. When they first came to Fair Lawn, the Yudins — the two adults and their oldest child, who was 2 1/2 then — lived in a standard local house, above the small space where the minyanim met. “Our salary was $25 a week,” Rebbetzin Yudin said. As the shul grew, so did the building; it moved to another part of the house, which was joined by its neighbor, doubling its size. Eventually, the community bought land across the street and built a shul. There still is a parking lot outside the Yudins’ house, which makes sense, because the house, with its perpetually unlocked door, is an irresistible magnet, apparently to everyone who’s ever met either Yudin. Really, any Yudin. And that’s a lot of people. For decades, he’s gone on Nachum Segal’s radio show, JM in the AM, where he discusses the parashat hashavuah — the weekly Torah reading. “His father had died suddenly, and his mother was sad,” Rebbetzin Yudin said. “He thought it would be a good treat for his mother if she could hear him on the radio.” It was. It cheered her. “So that started as a one-time thing — but it’s gone on for 30 years. He used to bring their children with him to visit shut-ins on Friday afternoons, his wife said, and now he brings his grandchildren to Daughters of Miriam. “That’s how they spend time with their grandfather. “My kids saw the whole life cycle growing up,” she continued. “They saw people in challenging times as well as in happy times. They were able to realize that the sad times also were part of life. And they saw people’s courage. They saw how some of them were able to pick themselves up and go on living, how their faith in God would give them some comfort. They weren’t afraid of funerals. They weren’t afraid. The Yudins have seven children. All their children are married, and all have children; some already have grandchildren, making Rabbi and Rebbetzin Yudin great-grandparents. Some of them live in Israel; the rest live either in New Jersey or on Long Island. “We get tremendous joy from our beautiful family,” Rebbetzin Yudin said. “My dad and a couple of others met in somebody’s living room” as they planned to open Shomrei Torah, Ms. Sherizen said. “I think about the courage it took for them to pull these first meetings together. There were a lot of nay-sayers.” But the community took off. And “Shevi always welcomed people into her home. And into her life. “I saw all that, growing up, and when I got married, I told my husband that the one thing I really wanted in my home was a guest room,” Ms. Sherizen said. She created one; she offered the same kind of hospitality the Yudins did. “I knew how to do that, I knew how to make our house the Shabbat and yom tov home, because I learned from Shevi. It’s a chain. One thing leads to anther, and you find yourself knowing how to do it. Many Russian-speaking Jews found their way to Fair Lawn in the various waves of emigration from the Soviet Union and then later the former Soviet Union. Most of them came with no Jewish background, but many of them found their way to Shomrei Torah, where the Yudins welcomed them. Laura Brook, who was born in Belarus and grew up in Riga, Latvia, is among that group. She moved to Fair Lawn in 1991. “I came with no religious background,” she said. “We knew about Pesach but celebrated it with a family dinner. I knew about Chanukah from my grandmother, and I knew that on Yom Kippur you fast, but it was just when I got here that I learned anything about it.” Her teachers were the Yudins. 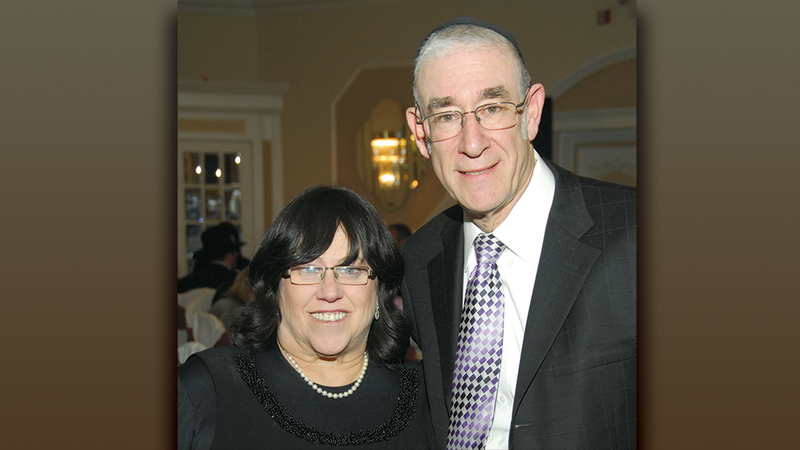 Elaine Reinheimer and her husband, Michael, moved to Fair Lawn 47 years ago, and joined Shomrei Torah immediately. She’d known the Yudins even longer; she was a secretary at YU when Rabbi Yudin was a student there. “I got a sneak peek at him, and that’s why I moved here,” she said. “My children are who they are today because of Rabbi and Shevi. They both live in Israel. And we include Rabbi and Shevi as part of our family. “My mother moved to Daughters of Miriam seven years ago, and Rabbi visits her every Friday,” she added. And then there’s Janusz Legutko, Shomrei Torah’s custodian. He was born in Poland, where he was a math teacher — and a Roman Catholic. He found his way to Shomrei Torah, where he got a job. He did not think about conversion, at least, not at first. But he was drawn in by the Yudins’ warmth and care, and also by the intellectual and spiritual content of their lives. Now, he lives in the Yudins’ house part of the week, and also is a counselor at the Sheli house for special needs kids. He grew very close to Rebbetzin Yudin’s father while the older man was getting dialysis, and so he, too, has been incorporated into the Yudins’ family. 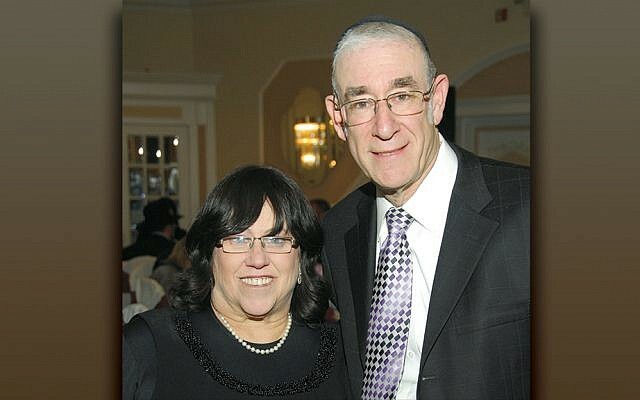 Rabbi Larry Rothwachs, who leads Congregation Beth Aaron in Teaneck, is married to the Yudin’s older daughter, Chaviva. The Yudins’ is a “50-year-long story,” Rabbi Rothwachs said. At the beginning, “there are many stories, some of them apocryphal, about how my father-in-law would pull people off the street for a minyan. Students of his would come for a daily minyan, and he’d promise them a home-cooked breakfast in return. “And then, slowly but surely, it grew, and people moved to Fair Lawn. It was at one point probably the biggest or second biggest established Jewish community in Bergen County, after Teaneck, and then the entire Jewish community in Bergen County exploded, but it became contagious. Today, there are seven Orthodox shuls in Fair Lawn, and the more options, the better. “What makes my in-laws most unique — there are several ways, really — but it mostly is that they are known to be completely selfless, in every way. There is no way for them that the rabbinate is a career. It’s not a job. It’s not really an occupation, even. For anyone, even for rabbis, there is a point of separation between their professional public persona and their personal one. My in-laws feel such a genuine love and connection for every person in the world, no matter how important or unimportant, and their home can become a second home — and in many cases a first home — for people who either were literally homeless or facing challenges. Their hands-on nurturing of so many people continues to this day. The two work together seamlessly, he added. “There is a real partnership between them. There are very few duties or tasks that they both do. There is hardly any overlap. He goes out there and brings people into the house, and she takes over from there — feeds them, clothes them, and loves them. He teaches them. She sits with them and counsels them. It is very natural and fluid. They don’t review it. There is no official set of policies and procedures. It is all 100 percent real, and they are selfless. “And the real miracle is that they and their children and their grandchildren are normal. They are very normal.” And almost all the men have gone into the family business, he added. Rabbi Yudin is almost too busy to talk, but he makes time, not grudgingly, but with a certain rushed patience. “I don’t have time, but I’ll make time in the time I don’t have,” he said. “I’m going to the hospital now,” to visit patients. “I don’t have a contract to go there, but it has to be done,” he said. “Personal involvement is the way I was privileged to build a congregation, and that has spilled over, thank God, to the community,” he said. “Having a personal rapport, one, one, one. Each person is made to feel welcome in the community. Over the years, the community has grown and it has what it needs — kosher food, a shul, an eruv, a mikvah, a charity fund, he said. “Each family has their needs, so at one given time we can have a funeral and a wedding. “The challenge is based on the third book of the Torah, Leviticus, where we are told to love your neighbor as yourself, to feel with them. If they are going through a loss, you have to be there with them. And two hours later, you have to switch modes and be ready to dance with the next family at a wedding. You can’t say, ‘Today I am not in the mood to dance. I just came from a funeral. The ability to focus on loving your neighbor as yourself — that is a challenge. When anyone talks about the Yudins, they always use the word humility. The Yudins’ modesty is bone-deep, they say; their humility, their insistence on being seen as just like everyone else, their understanding of themselves as no more giving, no more loving, no more generous than anyone else in their position would be, is a textbook illustration of humility in action. Of course, they don’t see it that way. They see themselves as just part of the community. But they do acknowledge the community’s marvels. “When you do a needlepoint, the back is all knots,” Rebbitzin Yudin said. “On the other side, you see, piece by piece, how it all comes together.” The community’s like that, she said; now, it’s full and bursting with color, its shape visible on both sides. The Yudins are more or less retiring, they say, but they are so integrally part of the community that their next challenge will be to withdraw from some parts of the leadership, to leave its direction open to its next rabbi and new generation of leaders, but also to stay on in a new role. Because when your job isn’t a job but your life, then it changes when you retire, but the love behind it doesn’t ever change. When: On Sunday, April 7, at 5 p.m.